Jalen is the happy little boy you see wheeling around the small town of Media, PA.
After his birth, it first appeared that he was developing normally. However, after not reaching early milestones, he was evaluated by a neurologist who diagnosed him with Microcephaly — his head is smaller than normal leading to the underdevelopment of the brain. This has left Jalen unable to speak, walk or eat. He also has the most severe form of cerebral palsy, spastic quadriplegia, is G-Tube dependent, and lives with epilepsy. His past five years have been filled with procedures, surgeries and constant doctor appointments — traveling to Children’s Hospital of Philadelphia several times a month. As parents, we have tried to provide him with as normal a life as possible– letting him experience everything a little boy deserves. 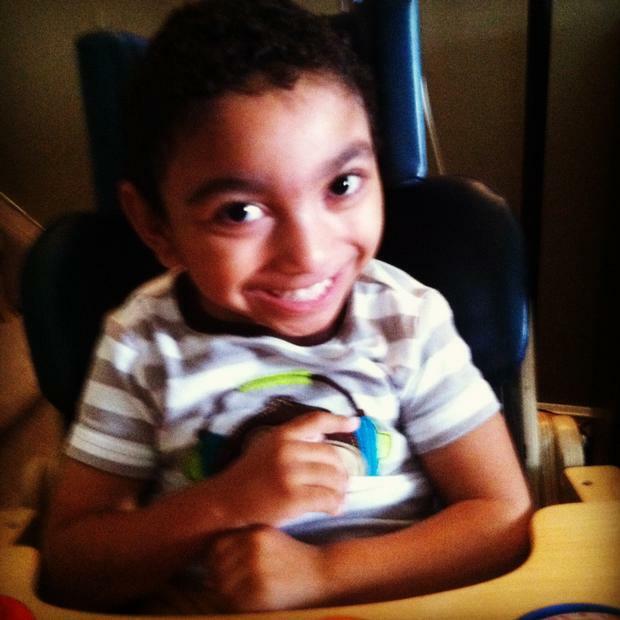 He loves the outdoors, music, playing with his two brothers, SpongeBob and attending preschool at Easter Seals. Jalen has continued to defy the odds as he has learned to roll around, trying to crawl and reach for items using adaptive switches. He is a very social little boy who communicates with his eyes. Even though Jalen is in a wheelchair and hooked up to a feeding machine for most of his day, he is the happiest little boy with his constant laugh — he is a joy to everyone around him. Even with health insurance, our family still has many uninsured, illness-related expenses such as: the need for a wheelchair-accessible house or the modifications of the existing home, the purchase of necessary therapeutic equipment, building of a handicapped ramp and the modification of the family van for wheelchair accessibility. To help offset these uninsured expenses, a fundraising campaign in Jalen’s honor has been established with Help Hope Live, a nonprofit organization that has been assisting the transplant community for 35years. In 2000 they expanded their mission to include those who have sustained a catastrophic injury more recently a catastrophic illness. All donations are tax-deductible, are held by Help Hope Live in the Mid-Atlantic Catastrophic Illness Fund, and are administered by Help Hope Live for illness-related expenses only. If you would like to contribute:Thank you for your support and prayers for Jalen. They are greatly appreciated. We are looking forward to Jalen’s benefit on 10/8/16 at Barnaby’s in Aston, PA. Jalen is now in 2nd grade attending HMS in Philadelphia. HMS specializes in schooling for children with Cerebral palsy. Jalen is now using an eye gaze system to communicate his wants and needs. Although seizures have increased he is doing very well and loving life! We hope to see you at the benefit! Thank you to everyone who made last year’s benefit a huge success! 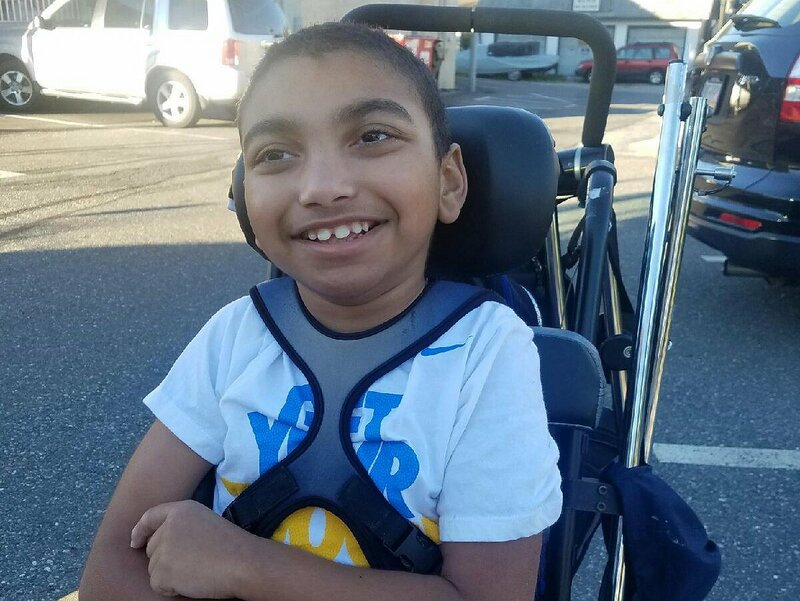 Because of your kindness and generosity Jalen is now able to ride in our van in his wheelchair by entering through a ramp! We cannot thank you enough for helping make this happen. In August Jalen graduated from Easter Seals. Although we were sad to leave a wonderful school and teacher we were welcomed with open arms to HMS of Philadelphia. This school focuses on children with cerebral palsy and will teach Jalen life skills, ways to communicate and help getting him mobile. We can’t wait to see all the wonderful things the future has in store for him! We look forward to seeing you at Jalen’s benefit October 11, 2014 at Barnaby’s Aston. Please join us for our 2nd Annual Benefit for Jalen on October 11, 2014.
jalen you have made much progress in one year. I can't wait to see what happens next. I loved seeing you swing in your wheelchair and walk in your waker. You are my special angel and i love you very much! Jalen - You were born to smile and you do that everyday. I love you to the moon and back!! !